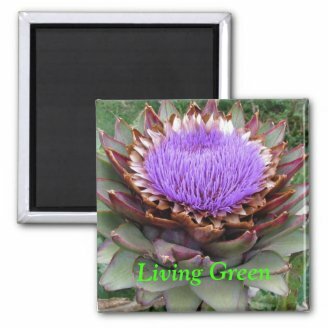 An artichoke is a thistle like plant that grows in several Medeterannian areas, and the areas I am familiar with are in Central California. Castorville and Watsonville, California are where you will see field after field of artichokes. If you're lucky you will see artichokes in bloom. Yes, they bloom like a flower. Some people wash the artichoke, and cut off the thorns first. I have eaten artichokes for years and never cut the thorns off, but I do cut the stem. Why cut the stem? I'm not real sure as I am not a "cook." Artichokes are grown in fields, and once they are ready to be picked they are harvasted and sent to Market. They should be washed out before cooking. I just run them under water. After you fill the pan (put enough water to cover the artichokes), you want to cook the Artichokes about 20 minutes. Some people say to cover the pot, but it's not really mandatory. I do move the artichokes around in the boiling water a few times, as they have a tendency to float no matter how much water I put in the pot. A few of the leaves will turn brown, but this doesn't affect the taste at all. To check to see if the artichokes are done, stick a fork in the stem. When it goes all the way in easily, your artichoke is done. The two ways I know to eat an artichoke are with butter and mayonnaise. I was told that if the artichoke is hot you eat it with melted butter, and use mayonnaise if it's cold. However, I eat mine with mayonnaise, and especially like the heart (the inside) with mayonnaise. Just put some on your plate and dip the leaves then scrape the leaf across your teeth to get the meaty part of it. Note: The first few leaves have very little of the good stuff on them, but the larger ones further inside the artichoke do. The outside of an artichoke has the leaves. Peel them off, and eat the fleshy part. Once you get near the heart, the leaves will be thin and lighter in color. Peel these off and then you will see what looks like soft hair (it's called the choke). Take a spoon and scrape this part out, leaving you with the heart, which in my opinion is the best part of the artichoke. 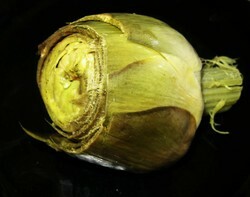 In fact it is the heart that you will see in the markets when you buy marinated artichokes. There are several different ways to use artichokes, and the cookbook here will give you recipes for 21 other ways you can eat artichokes. 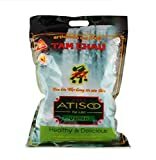 Hope this helped you if you haven't cooked or eaten one before. Experiment for the taste you like best, and enjoy. A friends quick gourmet recipe, Chicken Artichoke Casserole. This Artichoke Casserole is one of her many quick gourmet recipes. Well, I can't say I don't know how to prepare it anymore so I guess I'll have to eat one. Great info! Although I have loved eating marinated artichoke hearts for years, I have never cooked an artichoke and have been intimidated to try. Your information here makes me want to go out and buy one today and give it a try! I've only had artichoke once...a long time ago. I don't remember what it even tasted like. I haven't fixed them either. Good instructions. It is encouraging to read that the instructions are easy enough to understand for that for those of you that haven't cooked them. And as Chefkeem said, they are indeed healthy. Enjoy. I have been eyeing the fresh artichokes in the grocery store the last few weeks. I am always afraid to buy them because I don't know how to cook them. This is really going to help. So cool...artichokes are a new favorite. Thanks! Artichokes are in our local supermarket now -- I keep eyeing them, but haven't really known what to do with them. Now I do -- this might be a fun "treat" for us this weekend!